How do underwater explorers do their work? After all, most of the ships they seek to investigate lie hundreds, if not thousands of feet under the sea. 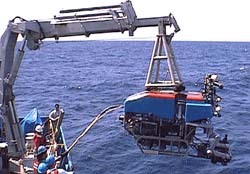 Robert Ballard's research has relied primarily on two remotely-operated vehicle (ROV) systems: Jason/Medea, and ARGO-II. area survey vehicle linked to Jason that functions as a precision multi-sensory imaging and sampling platform. Both Medea and Jason are designed to operate to a maximum depth of 6,000 m; they can be operated from a variety of research or commercial vessels. Jason is connected to Medea by a neutrally buoyant cable 15 mm (0.60") in diameter and approximately 100 meters long. Like the tow cable, it also uses three copper conductors and three single mode optical fibers, but uses Spectra fibers to provide strength while reducing size and weight. The cable has a working strength that will support a 1,300 kg load (3,000 lb.) and the breaking strength corresponds to a 5,400 kg load (12,000 lb.). Medea weighs 800 pounds in water and is maneuvered by controlling the surface ship's position within a dynamic positioning reference frame. Jason is designed for detailed survey and sampling tasks that require a high degree of maneuverability. It weighs about 1,000 kg in air, and is neutrally buoyant at depth. The vehicle is equipped with seven brushless D.C. thrusters designed to provide a force in any of the Jason's axes. Both Medea and Jason have been designed to be superior real time optical imaging platforms with high quality cameras and lighting. The vehicles work together to provide lighting for each other in a fashion not commonly available in other submersible systems. Medea is configured with a 1-chip color camera and a silicon intensified target (SIT) black & white camera for terrain identification and visual location of Jason when both are operating. 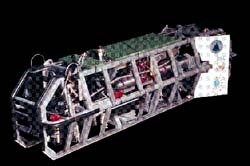 (towed at altitudes of ~3-15 m above the seafloor) designed to operate to depths of 6,000 m, utilizing a fiber optic tether to downlink power and controls to various subsystems and data sensors and uplink digital data in both image format and as data-streams.